What Are the Materials Used to Make a Tennis Racket? While playing tennis requires patience, physical strength and endurance, it also requires a key piece of equipment: the tennis racket. 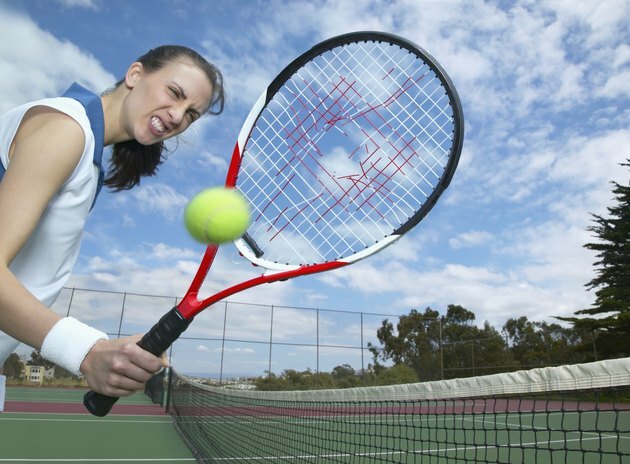 Early tennis rackets were made of wood. Over time, tennis racket technology has radically changed. Today, tennis rackets are made from a wide range of materials that are designed to maximize performance and durability. If you're in the market for a new tennis racket, it's important to understand what choices are available. Different types and grades of graphite, which is a lightweight material derived from carbon, are used in the design of a tennis racket. Racket frames can be made of 100 percent graphite or a composite of graphite and other materials such as Kevlar, fiberglass, copper, titanium and tungsten. Pure graphite frames tend to have a stiffer feel, making them more suitable for players who hit with power. Composite graphite frames tend to be more flexible and transmit fewer vibrations, making them ideal for beginning players who tend to mishit. Aluminum is a less expensive alternative to graphite frames. The frame of an aluminum racket can be tubular or bi-hollow. The shape determines flexibility and durability. Aluminum is more commonly found in less expensive rackets and offers a moderate amount of power and feel. Beginning players might consider a bi-hollow aluminum frame, which is more flexible and forgiving. Tubular aluminum tends to benefit more experienced players who hit with power. Boron and Kevlar are similar to graphite, with some slight differences. Both boron and Kevlar are lighter and stiffer than graphite and transmit vibrations more readily. Frames made from boron and Kevlar are extremely durable but also less forgiving than graphite or aluminum. Beginning players who have not mastered their swing might find that boron or Kevlar frames are too difficult to control and harder on the arm. Tennis racket grips can come in a variety of materials. The type of grip material you choose can depend on your skill level, style of play and the type of feel you're looking for. Common grip materials include rubber, leather or synthetic polymer materials such as neoprene. Synthetic grips can have a textured or patterned surface, which helps improve friction. Nylon is one of the most common materials used to make tennis racket strings. Depending on their chemical composition, nylon strings can be soft or firm. Strings made with a nylon-core offer a good level of performance and durability and are less expensive than other types of materials. Another string material option is polyester. A polyester string offers less power but more spin and tends to have a stiffer feel than nylon. Polyester strings can be combined with nylon-core strings to create a durable string bed with a softer feel. The most playable string is natural gut, which is made from animal intestines. Natural gut, however, is expensive and lack's durable. What Are Some Uses of Composite Materials?